No waffly intro on this one, am going to get straight to the point – this cake is sensational! 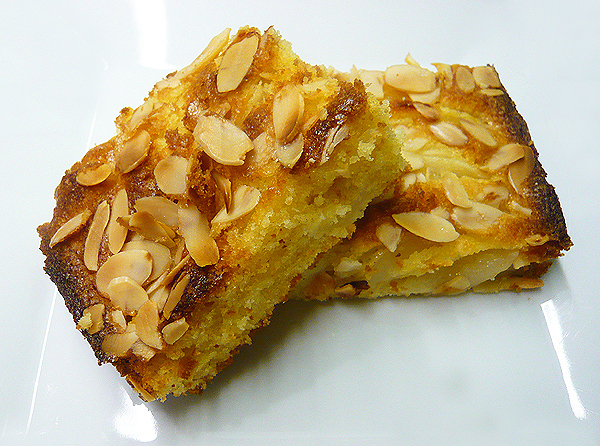 Sweet plump pears, moist almond cake and a sugar and flaked nut topping. I bake it in a brownie tin to get a thinner cake which gives a perfect fruit/cake/nut ratio. Have it alone with a big pot of tea in the afternoon, or dressed up with a dollop of crème fraîche at the end of a meal. Simple to make and absolutely divine…my kind of cake! Peel, core and slice the pears. Squeeze over half the lemon and set aside. Allow the butter to come to room temperature. Place all but 1 tbsp of the sugar in a large mixing bowl. Add the butter (cubed to make mixing easier), and cream with an electric whisk until pale and fluffy. Add eggs, one at a time, and beat until just combined (it may curdle a little at this point, but don’t worry the flour will sort it out). Sift the flour and combine with the ground almonds and salt. Slowly incorporate the dry mixture into the batter, beating lightly (be careful not to overwork). Add the almond extract (if using) and remaining lemon juice. Mix to combine. Grease and line a brownie tin with parchment paper. Pour in the cake batter then arrange the pear slices over the batter. Sprinkle with the flaked almonds and the remaining tbsp of sugar. Bake for 30 minutes, or until a skewer inserted into the centre of the cake comes out clean. Leave the cake to cool in the tin for 10-15 minutes. Serve the cake while still warm, or turn it out onto a wire rack to cool completely if you prefer to have it cold (equally good!). ~ by gourmettraveller on December 11, 2009.
yes let’s get right to it…I’m sure this was fab-tasting. pears, almonds, oh yes, I’m in. this looks delicous!!!!! i wonder if i could try apple instead of pear??? I was wondering if pears canned in natural syrup would work? All the pears available at the moment are not ripe, very hard and green. Suggestions anyone? I love the look of this cake and am going to make it for my husband’s 60th birthday party. I could certainly give it a go although my fear would be that the tinned pears have too much moisture and also will go very mushy after baking. If you are planning to make it for an occasion I would definitely suggest a trial run first in case the substitution doesn’t work out. Good advice. I will give it some thought. Tinned pears work fine, and we didn’t need to use the lemon juice. Also tried it with tinned apricot halves, and that was just as good. Thanks for a great recipe.